In his quest to bring tertiary institutions and other organisations in the fight against corruption, the Anti-Corruption Commission (ACC) yesterday unveiled the Accountability Now Club at the Obasanjo Skills Acquisition and Youth Transformation College. According to Principal of the college, Alhaji Sulaiman Fofanah, the launch marked the start of a stronger collaboration between the two institutions, and assured of their unflinching support to the fight against graft. “We believe that of the national must move forward, young people must take active part in national development but only with the required skills and technical knowhow. The fight is not a one man’s fight and it needs the effort of all and sundry, especially young people,” he said. Fofanah said because they attach so much importance to the launch of the club, they decided to defer their exams, while reiterating that the young must hold the government to account at all times. Principal Fofanah urged all students, especially members of the club, to stand for integrity and accountability with the assurance of his fullest support. 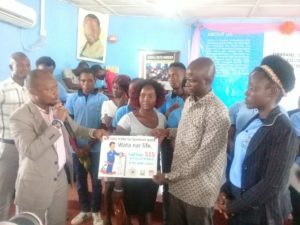 Launching the club, Senior Public Education Officer, Al-Hassan Sesay said they decided to have the club launched because of the importance they attached to the institution. “The club is not to serve as witch-hunt but a way of helping the administration to ensure that we bring sanity in the education sector. Our focus is not just reporting corrupt practices but we believe in preventive mechanisms,” he said. Sesay stated that they expect members of the club to talk to their colleagues to change negative and corrupt attitudes and urged them to serve as role models. “We want also to assist the administration in developing anti-corruption measures geared towards discouraging examination malpractices and other vices in the institution,” Sesay urged.